What did community leagues mean for Edmonton in the past—and what will they mean in the future? Go to any city council meeting or peruse the newspaper and you’ll undoubtedly find a community league representative advocating for what’s best for the neighbourhood. While this may seem normal here, even banal, the community league as an idea is a uniquely Edmonton creation. Some say community leagues have shaped our city, provided first platforms to several political leaders and built a culture of civic engagement that other cities lack. But just how and why did Edmonton’s community leagues start? And where are the leagues going in the future? The answer requires a look back into the past and into the future. In 1917, residents of Jasper Place created a unique movement. The setting was a population boom. 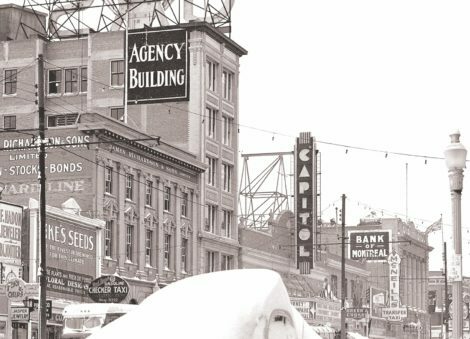 Edmonton had grown—from a sleepy town of 700 people, in 1892, to a thriving capital city of 67,243 in 1913. Edmonton had also, by 1913, amalgamated the City of Strathcona and the Village of North Edmonton. Wooden buildings were replaced with Edwardian brick and stone structures; utilities, bridges and roads were constructed; schools and hospitals were in place; business was booming. Land prices and real-estate investments were at an all-time high. But not all was well in the booming city. Between 1904 and 1913, the City of Edmonton approved 274 subdivisions and moved its western municipal boundary from 142 Street to 149 Street. That carved out the community of Jasper Place (Crestwood) from the larger unincorporated community, now West Jasper Place. 1913 then ended with an unexpected economic collapse. Real estate speculators cut their losses. Subdivisions were left undeveloped. Enter George M. Hall. Hall was an American journalist who came to Edmonton in 1912 as the Industrial Commissioner for the city. By 1913, however, Hall’s position was abolished. Regardless, he and his family continued to live in Jasper Place, which was isolated and had little infrastructure. Upset by this, Hall and the neighbourhood formed the Jasper Place Ratepayers Association (JPRA) in 1917. Hall travelled to the United States to research the Social Centre movement, which had formed Community Clubs in American cities, and the idea intrigued both the JPRA and the Horticultural Society. The University of Alberta provided an expert on the Social Centre Movement to speak when the two organizations held meetings with residents – and on March 3, 1917, they merged to form the 142nd Street District Community League. The league advocated for modern sewer systems, better roads and sidewalks, and for social and recreational events to bring people together. The principles the league adopted ensured the organization was open to all regardless of class or ethnic background; that it would not be affiliated with any political or religious order and that members would be both men and women. Hearing all community voices was a central value. The 142nd Street league’s work did not go unnoticed. In 1918, Bonnie Doon created its own league, advocating for water services and transportation. Strathcona organized in 1918 as well, and then came Westmount, in 1919. West Edmonton (now Calder), Riverdale, Terrace/Forest Heights, Calgary Trail (now Allendale), and Bennet School (now Cloverdale) all formed leagues in 1920. The communities identified their individual needs but soon realized they were competing for limited resources. By 1921, The Edmonton Federation of Community Leagues (EFCL) was formed. The first act of the Federation was to negotiate land for parks and recreation. Through property tax defaults resulting from the earlier real estate crash, the City of Edmonton had become the owner of almost half of all the land in the city—between 1918 and 1920, the City of Edmonton took ownership of 70,000 lots. In 1922, the city happily leased a block of land to each community league, for one dollar per year; the understanding was that it would be developed and used as parkland. The West End Community League was formed in 1922, in time to take advantage of the parks promise. By 1923, the league developed Kitchener Park, convincing the Gyro Club, a volunteer service organization, to install playground equipment, the EFCL to provide trees and the Horticultural Society to contribute plants and expertise. An Edmonton Journal ad on May 10, 1923, asked that “all citizens having the good of the community at heart and desirous of providing a beauty spot…arm themselves with spades.” An army of spade toting citizens answered and 150 trees were planted. On March 20, 1923, the call went out in the Edmonton Journal to “Citizens who have stubbed their toes and lost heels on worn out sidewalks, housewives who have moaned the dust of cinder walks, parents who want swimming pools and playgrounds in their district and all the public spirited citizens of the District of Oliver School.” At the first annual general meeting that year, further consideration was given to “the elimination of unnecessary noise, particularly at night, including domestic cats, shunting engine and trains, rattling street-car horns and whistles and crying babies in public audiences.” It’s unknown how successful the league was controlling cats and babies, and the community would be bordered by trains for decades to come. But the playground and swimming pool initiatives were resounding successes. The West End pool opened in 1924, following the openings of the South Side (now Queen Elizabeth) pool in 1922 and the East End (now Borden) pool, earlier in 1924. In the 1930s, the league built a skating rink and clubhouse at 114 Street and 107 Avenue. Then, in 1961, Molson’s Brewery donated a building that was moved to 118 Street and 103 Avenue, to be retrofitted and used as a clubhouse. The building served as a meeting and social hall for the league until its recent structural failure last year. In 1937, the West End Community League changed its name to Oliver Community League. The neighbourhood had taken the name of the school district and “West End” was no longer an appropriate description. The 1930s and the Second World War slowed community league activities, but afterwards, returning veterans and the resultant baby boom reactivated things. Population growth saw major change arrive. From 1961 to 1966, 13 high rises were built in Oliver, and by 1973 there were 38 more. The family homes that originally stood through the community were being demolished, and families were leaving. Young, single people filled the smaller living spaces. Most saw themselves as temporary residents and a community league did not appeal to them. Development also overtook downtown—only most of the new buildings were offices and commercial towers. The once diverse community, which originally featured houses and apartments on both sides of Jasper Avenue, was razed and rebuilt as a centre of government and commerce. This development was fueled by an oil boom, and the vision was to become a modern metropolitan city. At the time that meant building single use communities—a commercial downtown connected to the suburbs by freeways. Downtown residents during this period were still part of the Rossdale Community League. That league started as the Ross Flats Community League, in January 1929, and served the flats as well as the people on the hillside. There was no league for the top of bank community until 1931, when the new Rossdale Community League expanded its boundaries north to 104 Avenue, west to 109 Street and east to 97 Street. Construction of the James MacDonald Bridge, in 1970, spelled the end of the Rossdale and city centre connection. 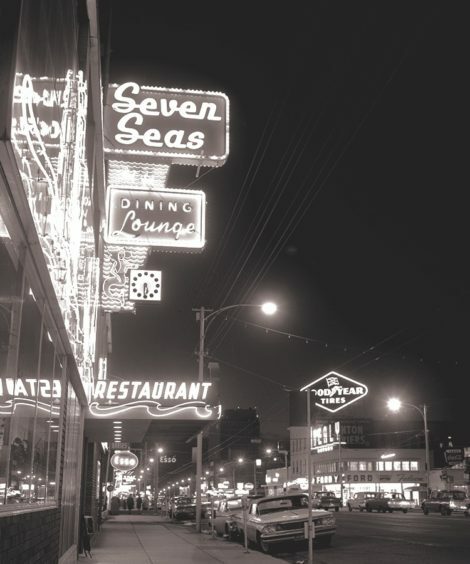 Although the Rossdale Community League revived itself, in 1974, the downtown neighbourhood had changed so significantly that it could not form a community. Then, in 1982, history repeated itself: the oil economy crashed. Downtown, only half rebuilt, died—and this time, there was no diversity to regenerate it. The residential and small business communities were gone. Fast-forward to 1997. The Capital City Downtown Plan identified an urgent need for a residential community and a budget for financial incentives to create housing. Bev Zubot and Mary Jane Buchanan were hired as Downtown Community Coordinators and tasked with seeking out and connecting the isolated residents of the towers. Posters inviting people to “Come Create Community Fun” led to a plan for Cornfest, now an annual event. In 1999, the organizing group formed the Downtown Edmonton Community Association (DECA) and, in 2003, they became an official community league. “The community development program created opportunities for neighbours to interact, discover common interests, and work together to shape their neighbourhood,” Zubot says. Chris Buyze moved near the newly improved 104 Street in 1999. He was attracted to the “cool heritage buildings” and the opportunity to live and work in the same neighbourhood. But he says the lack of amenities and places to meet people made him realize creating community was needed. For Buyze, the community league was the answer. Today, Buyze has been the president of the Downtown Edmonton Community League for 10 years. He says his friendships and long-term connections have all been made through the league. And, now, thanks to a population that has grown from 5,300 in 1997 to close to 14,000 today, the league is healthier. There are 200- 300 active members; 13 are board members, others sit on committees. Buyze says many are there to enjoy the social events. DECL also involves itself in new developments, park planning, block parties, Christmas mixers, community clean ups and programs for kids. Like Buyze, Luwam Kiflemariam is a young professional who’s dynamic and articulate. She has lived in Oliver for four and a half years and she, too, is a board member. After volunteering with a number of organizations, Kiflemariam says she has found her niche with the Oliver Community League currently as vice president. Most importantly, she says it gives her a voice in her community, the opportunity to make friends, and a way to give back. Both leagues concede that urban isolation is real and wish more people knew that the league was there for them. And both leagues face the challenge of communicating with the large number of residents who live in secure buildings. The old method of door-to-door introductions is impossible. Buyze says he would like more seniors to get involved, as well as people new to the city. He says he would like to hear more from the diverse populations that are coming to live downtown. Nevertheless, Laura Cunningham- Shpeley—the new executive director of the Edmonton Federation of Community Leagues and the former president of the Ritchie Community League—says leagues like DECL and OCL are becoming more important today, not less. This entry was posted in 2018 Fall, In Development.